What Jobs do The World’s Happiest People do? Are farmers happier than musicians? Do members of the clergy feel more satisfied with their lives than politicians? Are people happier in better paid jobs? The ONS has been collecting the data for the past three years, and What Works Wellbeing (a Government-funded think tank) have just collated it to examine exactly these questions. The results are really interesting, at least to a happiness geek like me. So what do they show? Life satisfaction is tied to some extent to salary, but less so as the salary rises. The chart is below. On the vertical axis, life satisfaction is plotted. On the horizontal axis, salary. As people earn more money, there seems to be an increase in life satisfaction. But this isn’t the whole story. Financial brokers, who are paid on average around £120,000pa, seem to be of middling life satisfaction. Clergy, on the other hand, who are paid around £20,000pa, are tremendously satisfied with their lot (although I think they get their accommodation with the job, so perhaps their salary is artificially low). Ditto elected officers and representatives. The survey looks at four questions: how happy people said they were yesterday, how anxious they were yesterday, how satisfied they are with their life, and how worthwhile they feel their life is. I was most interested in the jobs with the happiest people. They seemed to include sports related jobs – sports players, coaches, fitness instructors, dancers etc. Also people who did things with their hands – knitters and weavers are right up there. Also upholsterers and glass and ceramics makers. Farmers were also pretty happy. CEOs and elected officers are very happy, perhaps because they have a feeling of control. Hilariously, careers advisers aren’t very happy. Perhaps they should have a look at this data! 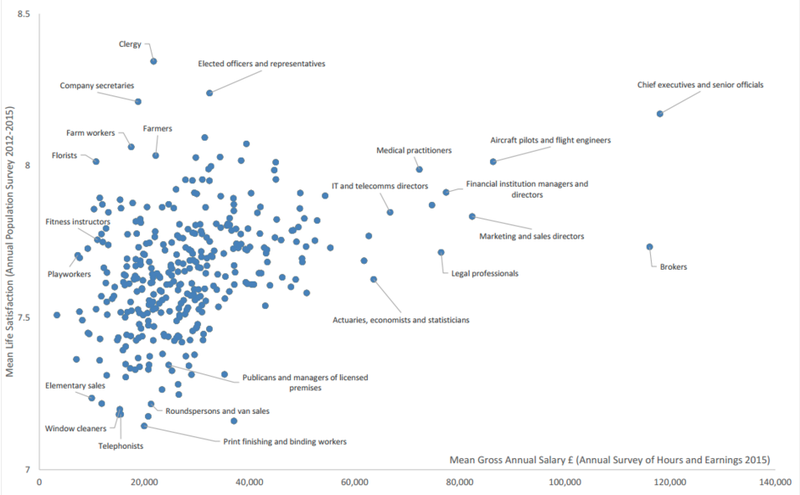 There seemed very little correlation between salary and happiness (unlike salary and life satisfaction). There was also not much correlation between salary and feeling like your life was worthwhile. Clergy topped this (again) but the rest of the pattern changed a bit. People in therapeutic professions make up many of the top ten – medical practitioners, psychologists, counsellors and therapy professions. Musicians are third (behind clergy and elected representatives). Who is the least anxious? So what professions have the lowest anxiety? Ok, so the data is a bit weird here. Some of it seems to be due to a small sample size (otherwise I really don’t understand why podiatrists are so anxious). Coal mine operatives are way off the charts in terms of anxiety, perhaps because they do dangerous jobs in a financially shrinking sector. But the strangest thing was that the professions with the lowest anxiety seem to be the ones I assume would have the highest. Ambulance staff! Paramedics! Air traffic controllers!! I can only assume these jobs attract people who are able to respond to stress in a calm way. I haven’t seen any studies on this though, and would be curious to know whether my hunch is correct. Anyway, the clearest thing the data shows is that money does not have a significant impact on life satisfaction, happiness, a sense of life being worthwhile, or anxiety. Working with faith, sports, music or nature do seem to make people happy, though becoming a CEO or an elected representative also seems to do the trick. And if you are an anxious person, become a paramedic. That will sort you out. Just kidding. I guess the final lesson is never to take data too seriously, given it can only report on a sample, and sometimes it’s hard to separate cause and effect.